Mahansthangarh and its Environs is part of the Tentative list of Bangladesh in order to qualify for inclusion in the World Heritage List. There is no doubting the archaeological significance of this site – the “earliest urban site” so far discovered in Bangladesh dating back to the 3rd century BC. 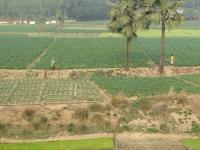 Its setting is wonderfully rural, a few miles outside the busy town of Bogra. There is not a great deal “above ground” to see but you can spend a pleasant hour or so wondering along the ramparts which form a square of over a kilometer in each direction (photo). The area “inside” the square is given over to agriculture (as is every square inch of land in Bangladesh!) and there was nothing obvious to see there. At the entrance there is a bluff above a river with the brick foundations of various buildings ( It is thought that the site was chosen as being one of the highest points in central Bengal – all of 35meters above sea level whilst Dhaka is a mere 6!). Beyond that all we could see was a nearby museum set in a pretty rose garden and containing a few carvings outside and in! I was disappointed however to see, in the Wiki article about the site, a photo of a large and seemingly “interesting” mound - which we hadn’t seen at the site (The article indicates that there are number of “mounds” spread in a 9km area around the citadel)!! I am rather annoyed that we missed it - but we won’t be going back to pick it up. The archeological site of Mahasthangarh lies in the north of Bangladesh, near the city Bogra. It dates from the 3rd century B.C. and now consists of mainly ruins. I visited it on my tour of Bangladesh in December 2006. First we have a look inside the little museum. Clay figures that were found on site are displayed, as well as many Hindu sculptures from later date. The original inhabitants of the area were Buddhist at first, then Hindu, and then Muslim from the 14th century on. We walked on to the citadel. It's a lovely walk in the rural surroundings: not too hot, not too crowded. The citadel used to encircle a large city, The brick walls are still there, jokingly called the 'Great Wall of Bangladesh' by my guide. The land inside the walls now mainly is used as vegetable gardens (harvesting potatoes, beans and pumpkins). From the wall there are also fine views of the bright green rice fields and the yellow mustard seeds. A couple of children are following us enthousiastically, but their English conversation skills halt at 'What's your name'. Unfortunately I doubt that Mahansthangarh will ever make it on to the World Heritage List. Bangladesh has a couple of more interesting sites on offer, of which I especially liked Puthia and Kantanagar. These sadly don't figure on the current Tentative List of Bangladesh.